My tree. It’s artificial, due to our building’s no-real-tree rule. This year, I put my beautiful Christmas tree up on Thanksgiving evening. I started decorating it that night; but I didn’t finish the job. I hesitate to call it a job, because it’s not a job, it’s a labor of love. I took a few days to finish. I wanted to savor the experience of decorating it. I’m very happy with the results, which you can see above. I love Christmas; I start feeling the stirring of the Christmas spirit in me before Thanksgiving. It’s all I can do to wait until Thanksgiving to start my tree. And I live in a pretty-much snow-less town: Seattle, Washington. When it snows for Christmas, I really get into the mood! It wasn’t always like this. In the mid-1980’s, I pretty much stopped celebrating Christmas, when what I perceived as its crass commercialization became too much for me to stomach. I felt bombarded by advertisements everywhere I went. I just couldn’t take it any longer. I decided the easiest thing to do would be to just ignore the holiday. And that’s what I did, for a few years. People at the bank where I worked would cheerfully inquire about my Christmas plans, and I’d explain how I had developed a habit of just ignoring the whole thing. What a buzz-killer that must have been for them! And, working at a bank was stressful. I could have used a joyous holiday to help me cope with that stress. But instead, I just got more stressed during the holidays. A funny thing happened in 1987. I married an atheist who liked to celebrate Christmas to the max. We made a strange couple: a Christian guy who ignored Christmas, and a female non-believer, who absolutely had to have a tree, presents, carols – all the trappings. During our engagement, and during the first year of our marriage, Sally Jo had to celebrate Christmas solo – well, we’d be together, but I would not be doing any celebrating. It’s crazy, because as a child, I absolutely loved Christmas. I’ve blogged before about how fabulous Christmas was when I was growing up. I’ve written of the manger display my folks set up in the parsonage where we lived, in Lower Naches, WA (a little town outside of Yakima), and about celebrating Christmas at the church where Daddy preached. 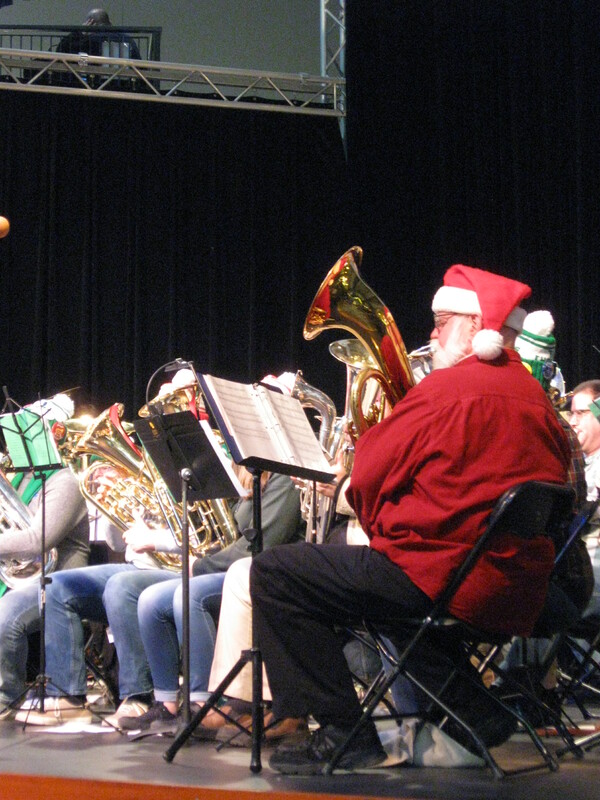 I’ve also blogged about celebrating Christmas at Hoover Elementary School. Christmas was big in the Yakima area in the 50’s and 60’s. Yakima Avenue’s business district was beautifully decorated for a good month. 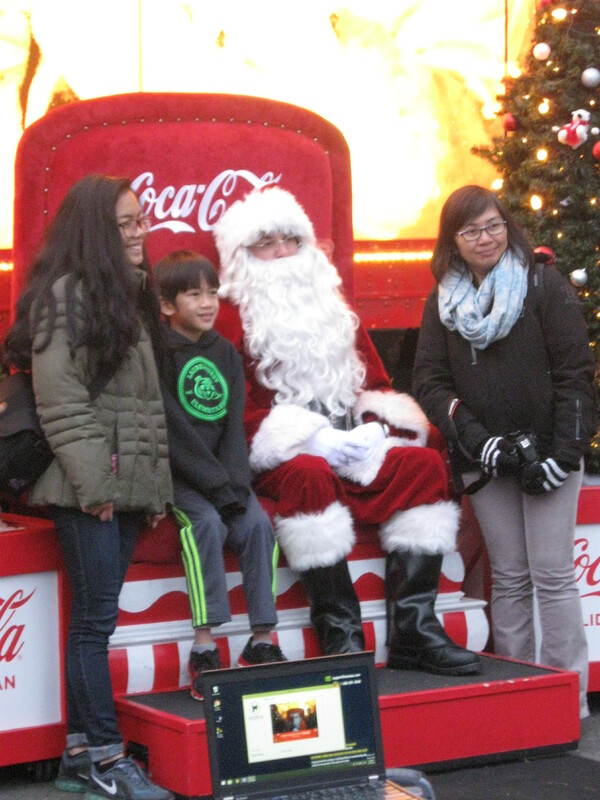 Santa Claus rode through town on a motorized sleigh. The Newberry’s department store basement literally became a child’s winter wonderland, the way it overflowed with fantastic toys, games, dolls, miniature robots, sports equipment. My family always had a beautiful, live tree, festooned with the most wonderful ornaments, and those crazy aluminum ice sickles we flung all over the tree. 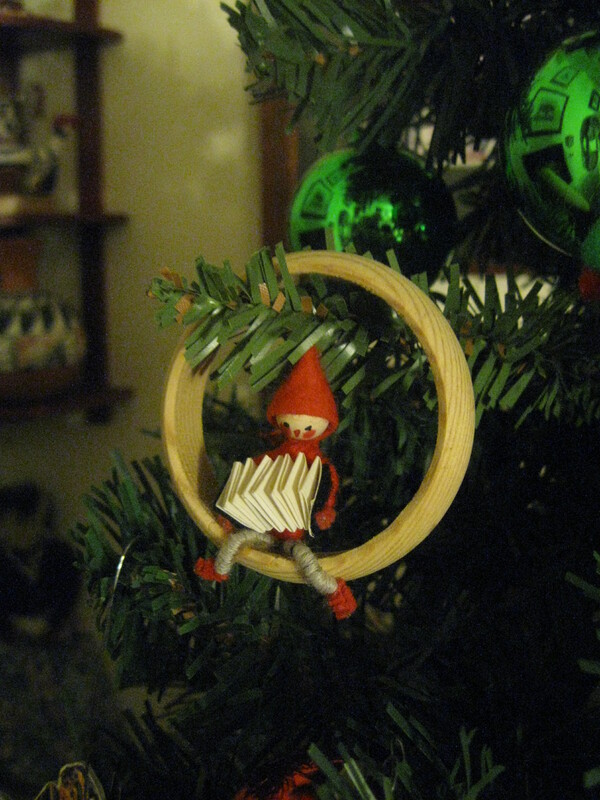 I still owned a couple of those ornaments – very few; but some. But as I mentioned above, in the mid-80’s I became stressed out by the commercialization of such a wonderful time of the year — a time of celebration; and I more or less turned my back on Christmas. 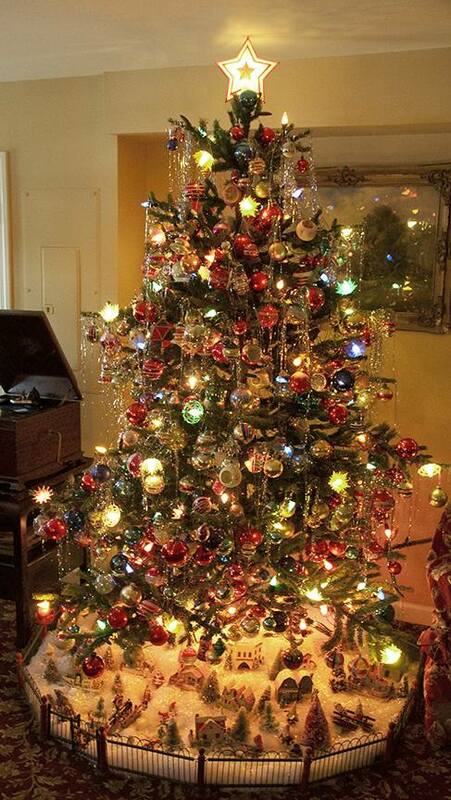 I didn’t bother getting a tree for a few years, so those old family ornaments sat in a box, on a shelf, in the closet. 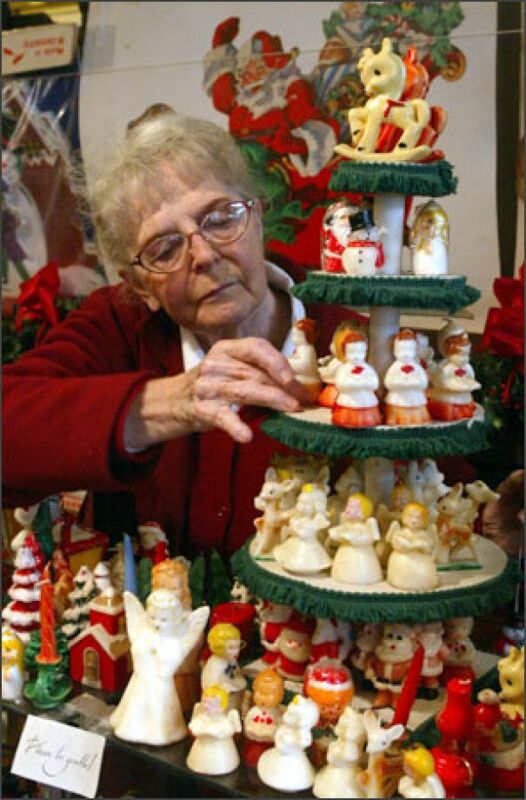 Marge Dau, setting up a Christmas candle display. 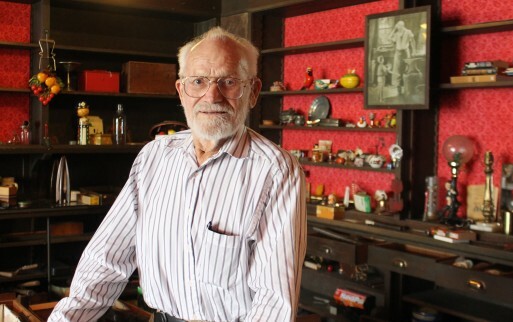 Things changed in the fall of 1988, when I found myself in my favorite little antique store in Seattle’s Pioneer Square, Old Firehouse Antiques. Marge and Fred Dau, the kindly owners (and they really were! 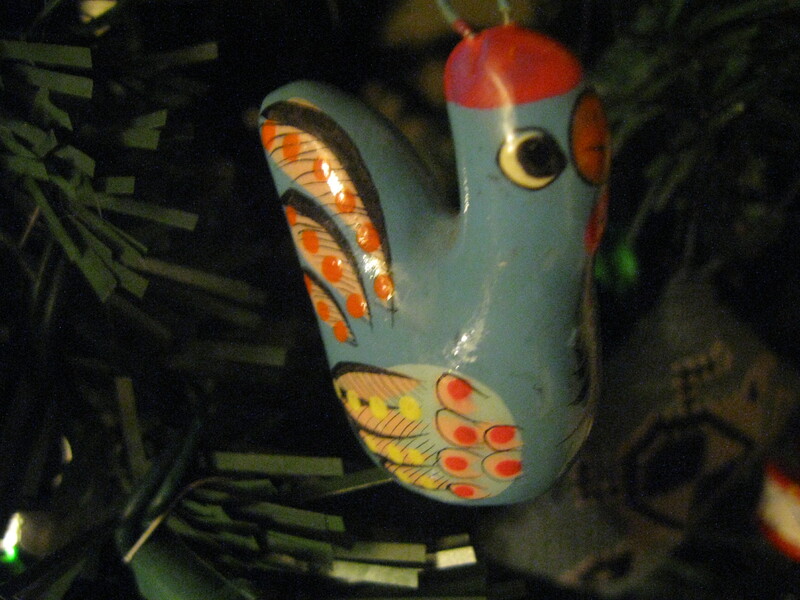 ), offered an amazing array of old things: decorative items, furniture, gadgets, pottery, pictures, and yes, Christmas ornaments. One day, while browsing for vintage decorative objects (old stuff) which potentially would fit into the apartment Sally Jo and I shared, I spied a large table filled with vintage and hand-crafted Christmas ornaments. I was definitely not in the store to buy that type of item. But, I stopped, picked up one of the ornaments, and examined it carefully. I really looked at it. And I felt drawn back to my childhood memories. The ornament I chose to pick up was the German door harp, seen below. 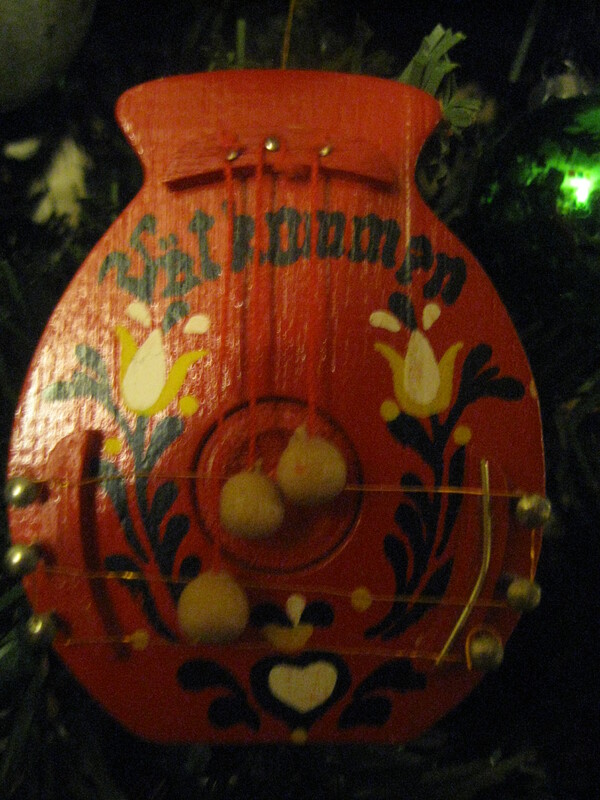 Door harp ornament, with “Welcome” in Swedish, painted on it. I examined the rest of the ornaments on the big old table. I noticed how some of them really had some age on them. And I admired their hand-crafted charm and uniqueness. 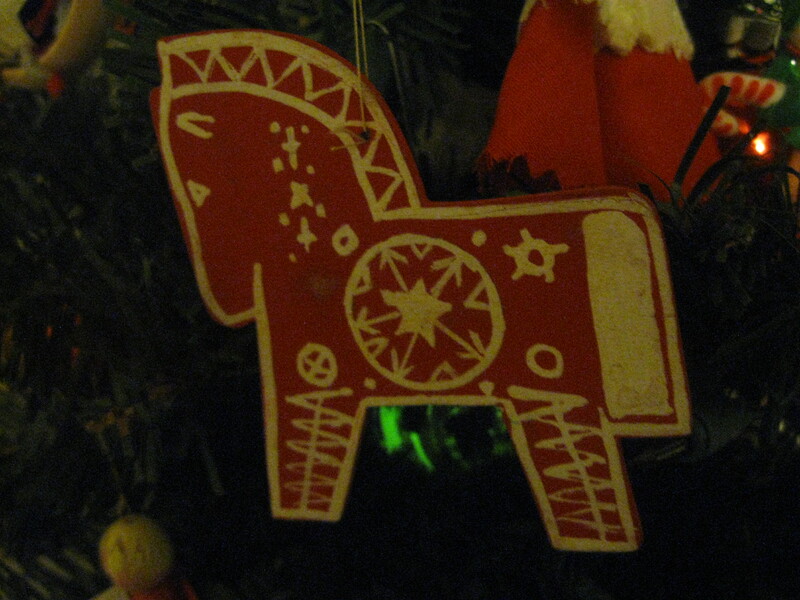 There were ornaments from countries far and wide. And then, I saw how inexpensively priced they were. Marge and Fred were practically giving them away. – Perhaps that was their way of encouraging folks like me to get into, and stay in the spirit of the season. I walked out of Old Firehouse Antiques with a couple of sacks just full of old Christmas ornaments. Fred Dau in the Dau’s other store, Admiralty House Antiques. I brought the ornaments home, showed them to Sally Jo, and she loved them. It wasn’t too many weeks before the time came to find a tree, and set it up for Christmas. This time, I went with Sally Jo, helped pick out a tree, and helped decorate it. 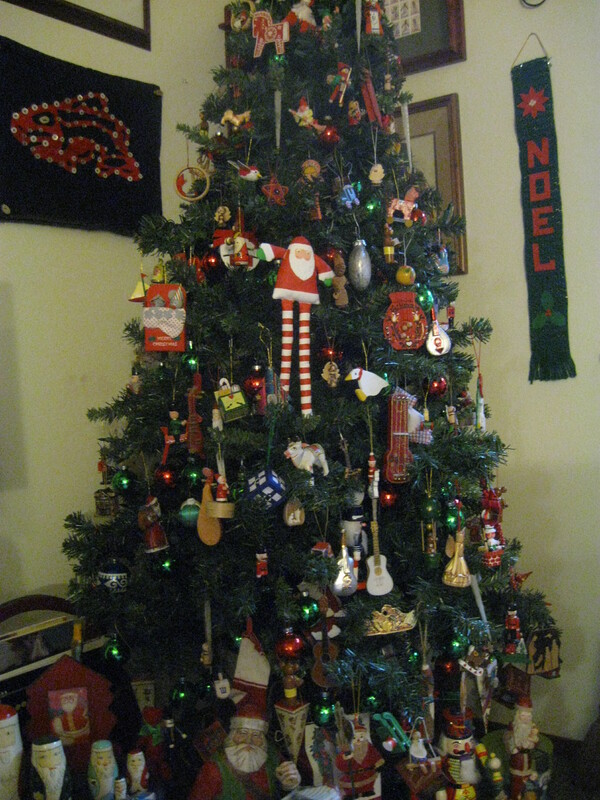 We used decorations from her existing collection, from my small family collection, and we used those I purchased from Marge and Fred. My, oh, my, was our little Doug Fir beautiful on Christmas 1988. 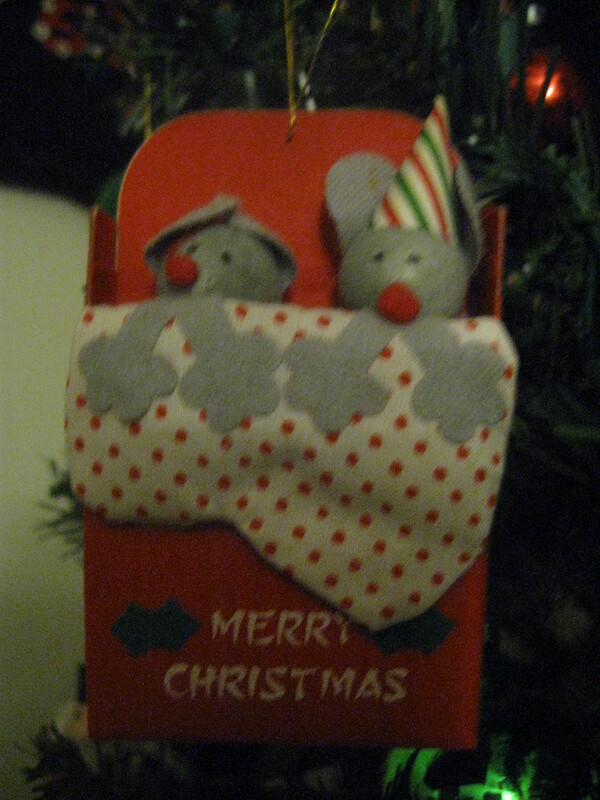 Not only that, but I regained the Christmas spirit! Hanging those vintage and hand-made ornaments on the pretty, green tree brought back wonderful memories of my Lower Naches and Yakima childhood. At 39 years of age, I had the spirit of Christmas reborn in me. My Mom, Jeannie, made the cloth doll in the 70’s. 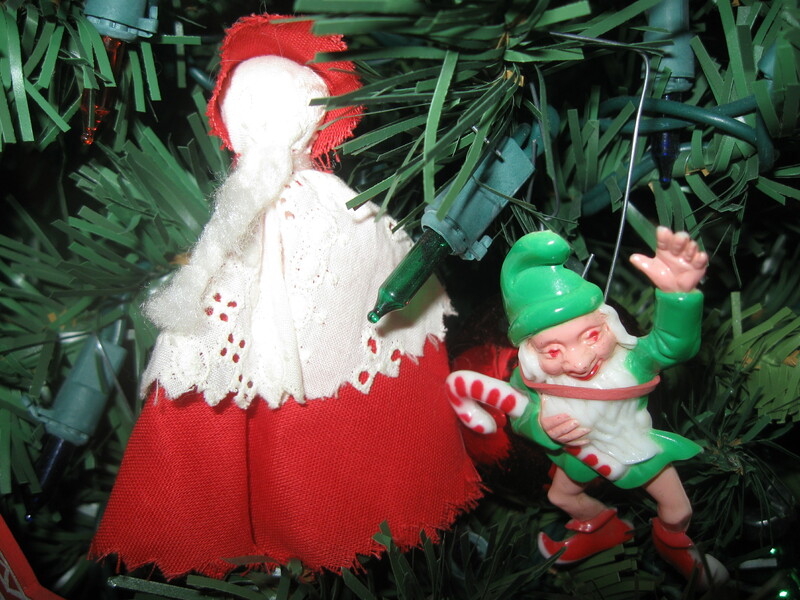 The little elf made its first appearance on the Bowles Family tree in 1952. 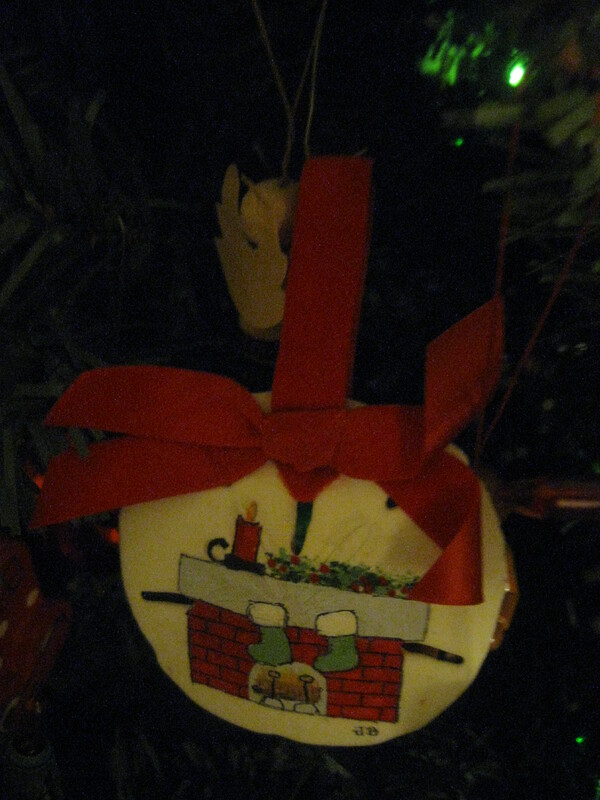 There are also a couple of photos of ornaments which have been in my family (a family of one now, as Sally Jo has passed on) since 1952. 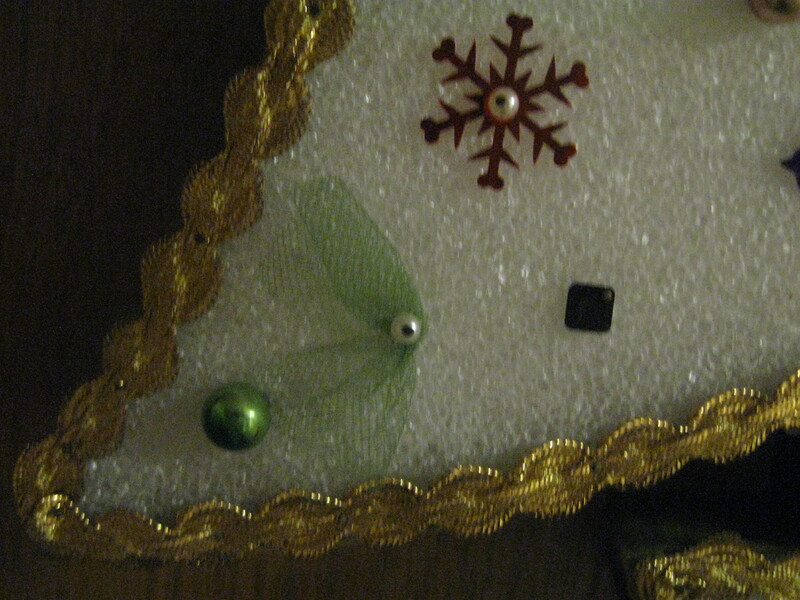 And, there are a few photos of ornaments I’ve picked up in the ensuing years, since the late 80’s. I hope you enjoy seeing them, and I hope that, if your Christmas spirit needs a little boost, my story will help. It’s amazing what picking up an old ornament in a little Pioneer Square antique store did for me. Merry Christmas, friends. These little mice have so much age on them that their ears have folded. Purchased from Marge. 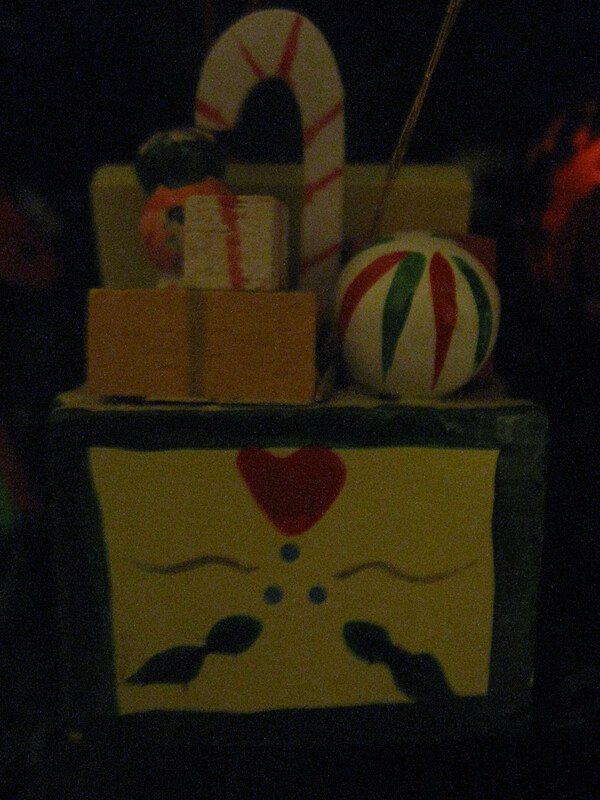 This toy box ornament reminds me a lot of the toy box my brother Al III and I kept our treasures in when we were children. 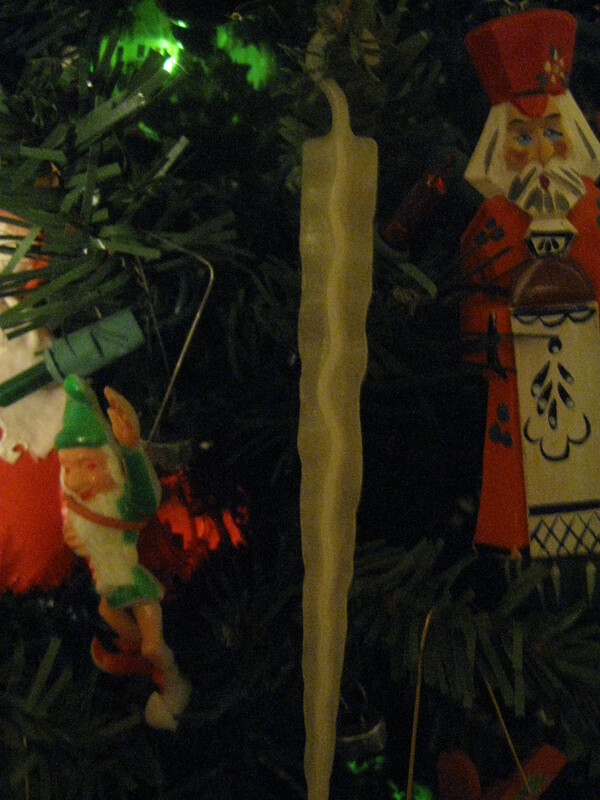 This is a radioactive glow in the dark ice sickle from 1952. I’m not sure what element it contains, but I don’t get too close! I have six of these. They first hung on our tree in Lower Naches, WA. This ornament is made from a sand dollar. Very unique. Here is a little Scandinavian accordion player. 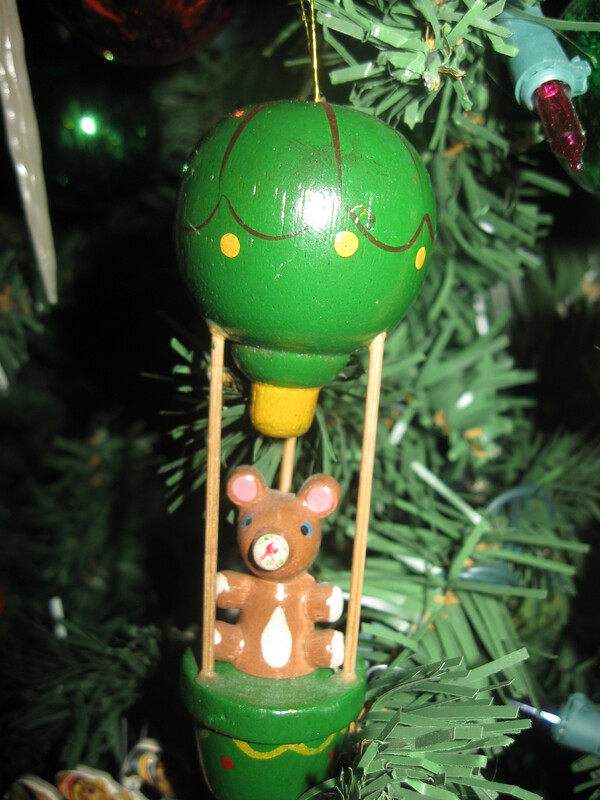 Here is a little bear riding a hot air balloon. 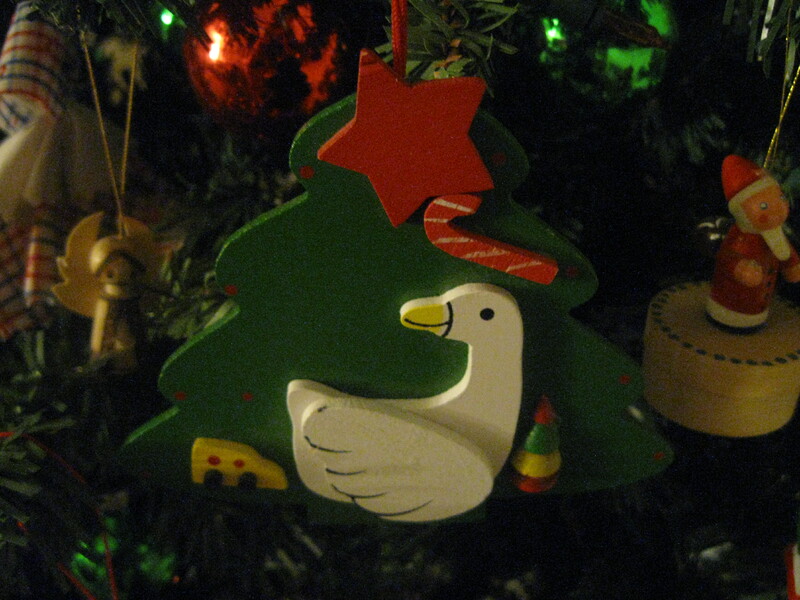 I love this large ornament featuring a Christmas goose. I am thinking this is Russian. Any guesses? We end with my latest acquisition, from the 2000’s. 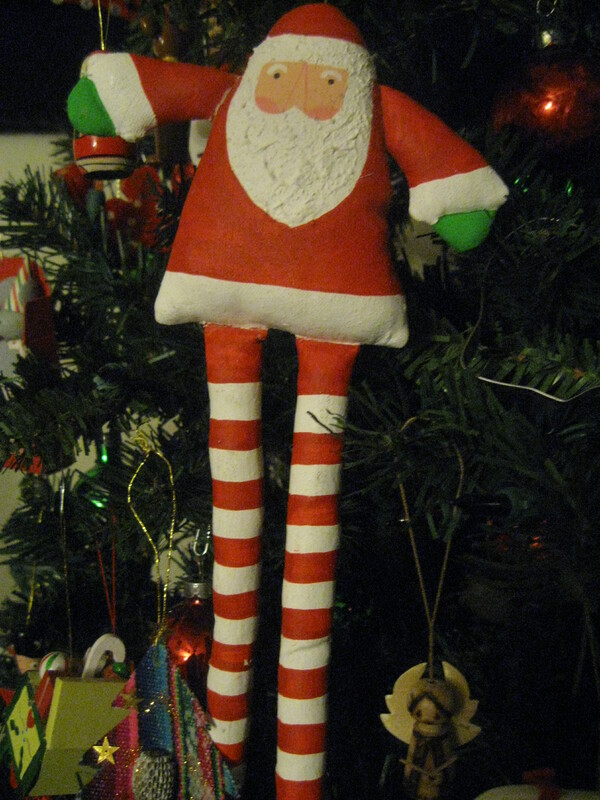 I got this hand-crafted Santa at a Pike Market thrift shop for the princely sum of $3. I walked out without buying it; turned around, went back and got it. And am I glad I did! Well, it’s time to put the tree up once more! 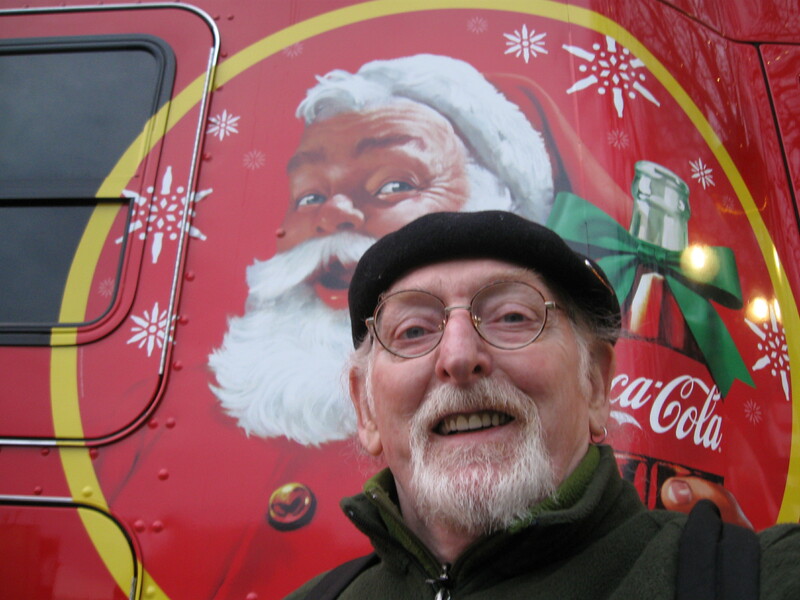 I’d like to thank all the folks in the Yakima area who helped form me, who helped instill the love of Christmas in me. I consider myself fortunate to have had such a magical childhood, which included great Christmas celebrations. Please be extra kind this season, and spread the love to everyone you meet. They may or may not celebrate in the same manner as you; but remember, we need to be spreading the love these days. — And, there are those folks, on Facebook and elsewhere, who seek to divide us over many things. Don’t let them! Let’s come together in December 2018, and make new memories, together! Blessings. Please share your thoughts/stories/memories with me in the comments section. 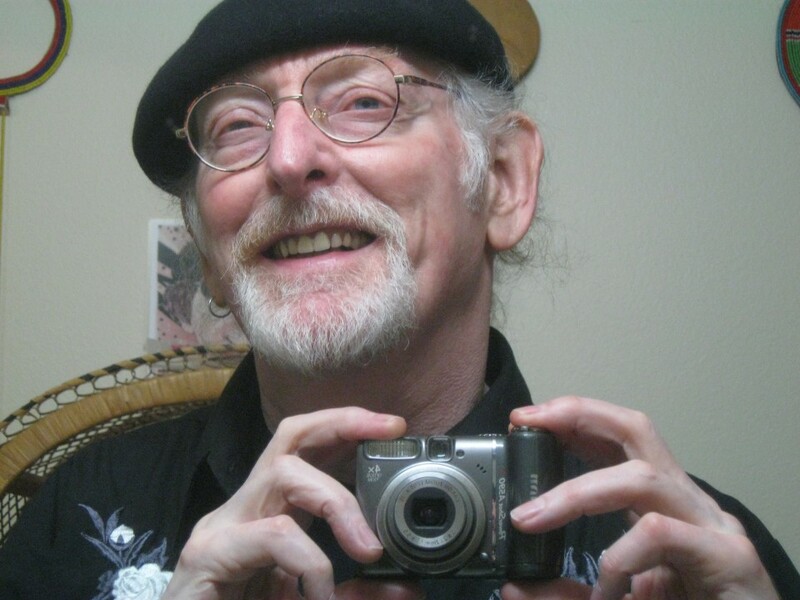 Sometime in the early 1990’s, Sally Jo and I were at Seattle’s People’s Mercantile, in late November, shopping for items like winter gloves and scarves — winter warmers. We noticed some beautiful Christmas trees for sale. They were not only great trees; they were reasonably priced. And get this: they were organic! Well, we had never had an organic tree. So we returned a few days later, and bought a pretty one. As per usual, we decorated that tree to the max. Every morning when we woke up, the first thing we would do was to go look at the beautiful tree. And one morning, about a week after we bought the tree, we saw dozens, if not hundreds, of baby spiders hanging from the branches via little tiny webs! I’ve heard of a living Christmas tree, but that was ridiculous! That was the last time we sprang for an organic tannenbaum. Nothing Says Merry Christmas Like A Styrofoam Tree! 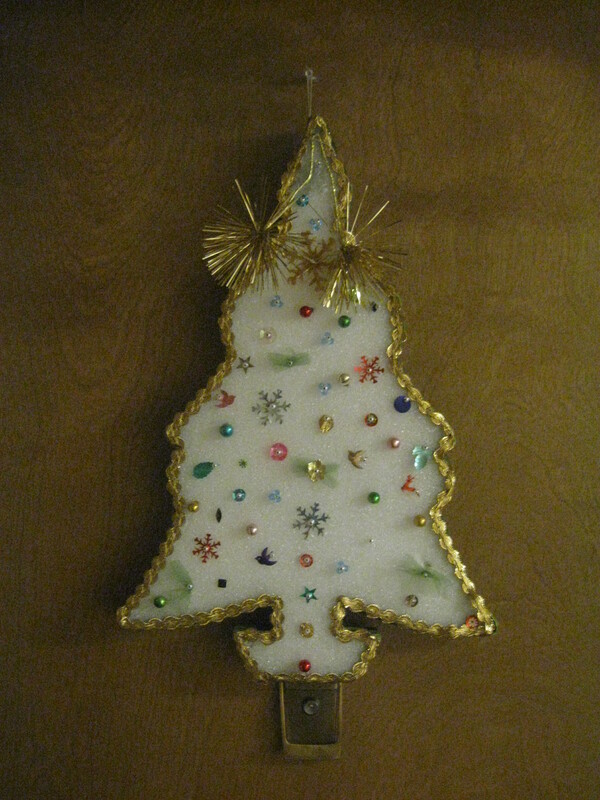 Feast your eyes on this oh, so tasteful styrofoam Christmas tree I found in 1995 at a north-end (Seattle, WA) thrift shop when I was out and about, spending big-time cash with my late wife, Sally Jo Davis. I was more than willing to pay the 79 cents it was going for. I can imagine this being lovingly hand-crafted by a very old person in a church basement or senior center recreation room. Or, if you want to go in the opposite direction, maybe it was made by a five year old! What I am saying is this: someone would have to be in his or her first or second childhood to make this thing. — I just somehow get the feeling it was made by a senior. Which is appropriate, because I live in a senior building, and I proudly display it in same. This beauty is trimmed with bric-a-brac; it’s decorated with colorful, shiny beads, pins, some kind of gauzy fabric, and geegaws. It’s crowned with two stars made of some kind of foil-like material. — I can’t be more specific. I’m not a crafter. I’m a collector. I assume the tree was made sometime around the 1960’s or 1970’s. It definitely looks like it came from that era. It has somehow survived the ravages of time, and taste. I guess I like the tree because it’s such an underdog. If it was able to come to life, I think it would be ashamed to learn that it was on sale for 79 cents. But I hope it would feel better knowing that someone like me, who can appreciate it, rescued it from the trash bin. Actual photo of our community room. Anyhoo: It was my first Christmas here. 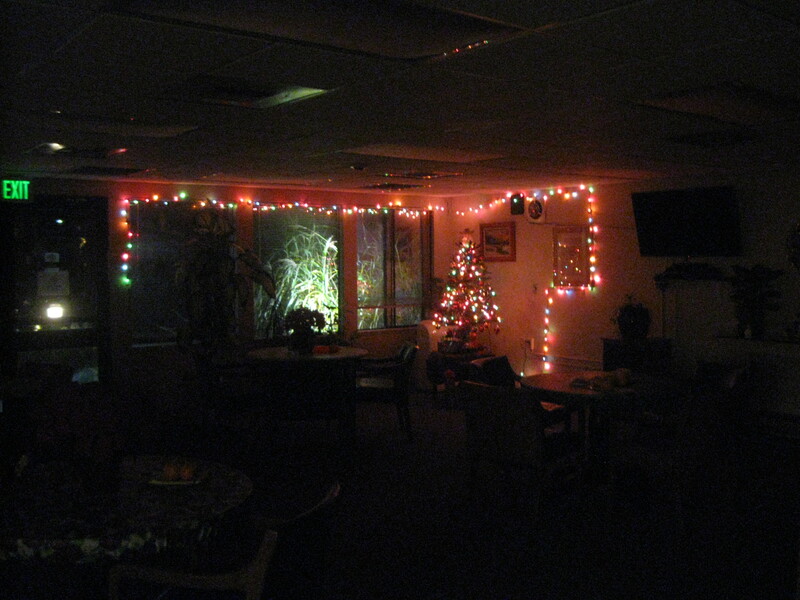 In an attempt to add a little holiday cheer to our environs, I hung the tree in the building’s community room. I thought it would be a nice gesture to share it with my neighbors. However, a day later, when I checked to see if it was still hanging on the wall, I found that my beloved tree was gone. Four old ladies happened to be in the room, playing their regular Tuesday night game of cards. I turned to them and said, “Hey, I hung a little Christmas tree on the wall for everyone, and it’s gone!” One of the ladies, Virginia, said, “Well, someone didn’t like it all that much”. On a hunch, I looked in the little storage closet which is adjacent to the community room, and there was my tree, sitting on a shelf. 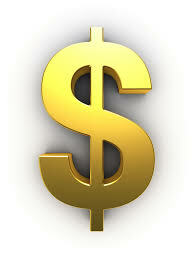 I grabbed my treasure, took it upstairs, and hung it outside my unit, on my front door. 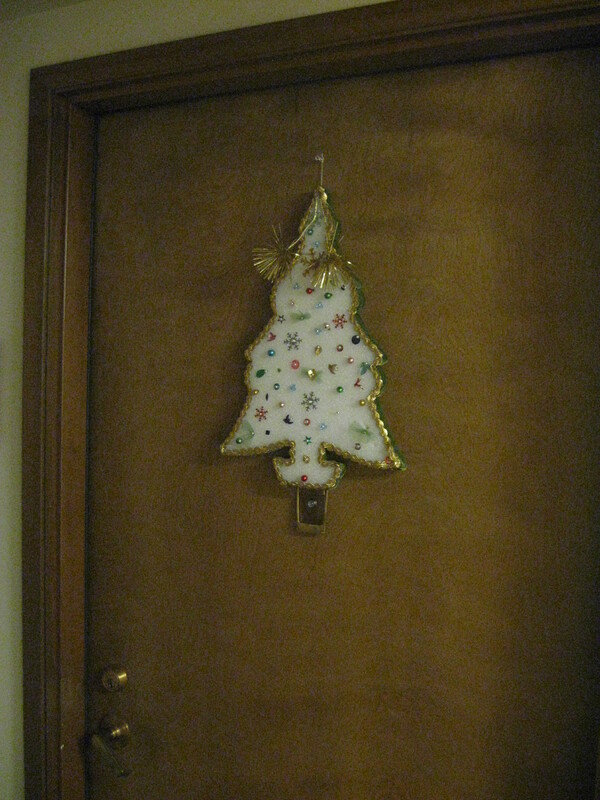 And every Christmas, I put it back on my door. I dare anyone to take it off my door. Merry Christmas.